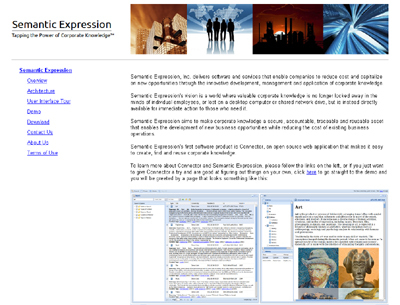 Semantic Expression, Inc. delivers software and services that enable companies to reduce cost and capitalize on new opportunities through the innovative development, management and application of corporate knowledge. Semantic Expression’s vision is a world where valuable corporate knowledge is no longer locked away in the minds of individual employees, or lost on a desktop computer or shared network drive, but is instead directly available for immediate action to those who need it. Semantic Expression aims to make corporate knowledge a secure, accountable, traceable and reusable asset that enables the development of new business opportunities while reducing the cost of existing business operations. Semantic Expression’s first software product is Connector, an open source web application that makes it easy to create, find and reuse corporate knowledge. Current problems with corporate knowledge management are largely a result of the success of an earlier effort: the transition from paper based documents and business processes to general office applications such as e-mail, instant messaging, word processing, presentation software and spreadsheets. Although this transition produced significant improvements in productivity, the rate of improvement has stalled as office applications reached limits in terms of size, complexity and the scope of their original design goals. As a result, these applications have not changed much during the last five to ten years and continued incremental improvements are unlikely to yield major increases in effectiveness or efficiency. These general office applications are effectively the legacy applications of today, not unlike the old green screen COBOL applications of an earlier era. Their entrenched status makes them difficult to compete with or dislodge, and as a result, developers of new applications generally create products that coexist with them by including legacy document formats as attachments. However, instead of improving reuse of corporate knowledge, these approaches actually have the opposite effect: they bury corporate knowledge in another layer of technology. Some companies hoped that the shift to the user generated content of Web 2.0 would solve the corporate knowledge management problem. Instead of a centralized top-down “managed” approach there would be a bottom-up decentralized “shared” approach that would increase collaboration and make the free exchange of knowledge easier. Although recent efforts to develop corporate wikis, blogs, instant messaging, content management systems and knowledge bases have produced positive results, the trend is not universal and no single vendor or product has reached a position of noteworthiness. Furthermore, in some organizations, employees are now awash in company chatter, requiring them to sift through large amounts of talk with low information content, which adds a new issue of time management to the existing problems of corporate knowledge management. What is needed is a breakthrough approach that delivers real improvement in the ability to manage corporate knowledge. This approach must have a direct impact on a corporation’s bottom line by making it more efficient and effective to apply and reuse corporate knowledge. Semantic Expression is dedicated to delivering this breakthrough approach to corporate knowledge management. Connector is the first in a family of products that will enable companies to maximize the value of their corporate knowledge.